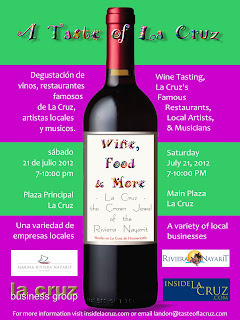 Joy and flavors will be the main attraction at Riviera Nayarit next July 21st as the main plaza (Plaza Publica Benito Juarez) of La Cruz de Huanacaxtle hosts A Taste of La Cruz ,“Wine, Food & More”, a celebration on the offerings that can be found at this lovely town. Activities are programmed 7:00 – 10:00 PM. This event, coordinated with the Marina Riviera Nayarit, La Cruz Business Group and Inside La Cruz .Com will once again feature all of the businesses of La Cruz, highlighting the diversity of services, retailers, restaurants and musicians in the quaint village that has been called the “crown jewel” of the Riviera Nayarit. Last January’s first ever Taste of La Cruz was a runaway hit, attracting over a thousand visitors to the Marina Riviera Nayarit for the expo, fun, food and music. This July installment has been developed for the less hectic summer pace and the Main Plaza of La Cruz is the perfect place to gather on a warm summer evening to once again partake in the festivities. Enjoy a stroll through the newly renovated Plaza Benito Juarez and enjoy the people, the music, the food and atmosphere of the REAL Mexico, La Cruz style. A special highlight of this summer edition will be the option to sample wine and choose a wine/food pairing offered by select restaurants. In addition to the incredible local and international cuisine, artists and craftsmen of the Cooperativo Huanacaxtle will offer handmade art & crafts from the local region, local businesses will be available to explain their services and La Cruz musicians will fill the night with tunes. The Conventions and Visitors Bureau of Riviera Nayarit congratulates the organizers of such an amazing experience for their contribution on the efforts of promotion and attraction of tourism through the development of successful events. Relish the music, be enchanted by the amazing arts, have a delectable sip and truly savor A TASTE OF LA CRUZ. Net proceeds of this event will go to the operating fund of the WORK FOR FOOD program in La Cruz.